Just one day left to order! Two weeks into the New Year, most of us will have already broken at least some of our new year’s resolutions. No need to feel guilty – we know how difficult it is adhering to those well-meant commandments typically fashioned in a haze of a little too much food and liquor. But not to worry! The Nature's Co. January “Post Party Pampering Beauty Wish Box” will put you right back on track (well, at least when it comes to beauty) providing you with all the essentials you need to unwind, cleanse and focus on crafting a more relaxed, more healthy you. The Nature’s Co. New Year special Beauty Wish Box aims to help us say ‘good-bye to the nasties and hello to the goodies’ after all of the partying, eating and late nights we party-girls indulged in, maybe in a little too much excess, over the festive period. At this time all you need is detox, exercise and relaxing to gear yourself up for the new year. Themed Post Party Pampering, this Beauty Wish Box offers an insight into 6 deluxe size sample beauty products that will help your skin, hair and body detox, rejuvenation, restoration and nourishment. 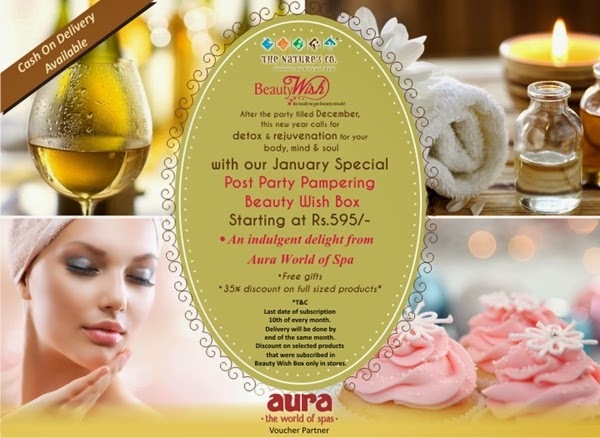 To complete the post party detox regime the Aura Thai Spa in association with The Nature's Co. is providing mesmerizing spa treatments at exclusive discounts to all Beauty Wish Box subscribers. Rescue your beauty with the much needed pampering you deserve this new year! For the romantic month of February look out for our Valentine Day Special Beauty Wish Box!